Tom Noir Comments: Joey’s mom shows up unexpectedly at his bachelor pad. Willo the Wisp seems to be hiding behind her head. And what’s with the pair of Iron Crosses flanking the title? The blurb seems to be telling me, in a roundabout way, that this is a horrible book. I believe it. After the blue lights had faded, Athaya decided she would never again select her hairdressers on bicep size alone. Is it just me, or do those arches look as if they’ve been crayoned in? Julian Sands decides that Derren Brown book was a wise investment. Candles, vapors, swooning. Athaya’s aroma therapist gave her everything she wanted, until the day he wore his sword. Now he would take – without asking! Wait, is he wearing rubber muscle shirt and pants? Well at least he is liquid proof. Queen blew the castle budget on the candle holders. Are those stink lines wafting off of Princess Athaya? She’s using way too much perfume. @Tag Wizard — beard-wielding? He’s wielding a whole lot of stuff but nary a beard … unless you are implying that the princess is his “beard”? Ooh, good save, Tag Wizard. I hadn’t noticed Dave Lee Travis concealed in the candle stand. @Tag Wizard – you have a good eye for beards! Does that make you… The Wizard King??? And are you rocking an epic ponytail? Julie Dean Smith writes very dood books, says Gene Simmons. Behind the wizard’s right foot–where is that pool of sunlight coming from? I’ve heard of Princess phones, but not Princess lanterns. Oh so very busy. So much color and detail. A mescaline manifestation of motile formal and freeform color and flow. What it means or is does not factor. This is a DMT alternate reality inter-referenced perceptual journey, with clear insights into the infiniverse. The story is an ever expanding exploration into the individually perceived subjective reality of their surroundings. Dude, watch the upcreep on that right hand. You’re the Wizard King, not a Lizard King. And it feels like there should be a tag for the kind of belt buckle she’s wearing. I think it’s that monkey from the space-banana pile. @Mr Chiclitz, monkey tag added (and with only mild annoyance at the species for not conforming to the pre-existing “ape” tag). Good shout! @T-Wizâ€”Thank ye, kind sir, on the simian thing. By the way, good catch on that beard! Not often is Sri B’Mancer given a comeuppance. @B. Chiclitz — Don’t you feel bad now that you’re making The Tag Wizard spend the weekend updating all the monkey tags on the appropriate book covers. There must be a barrel of monkeys here! 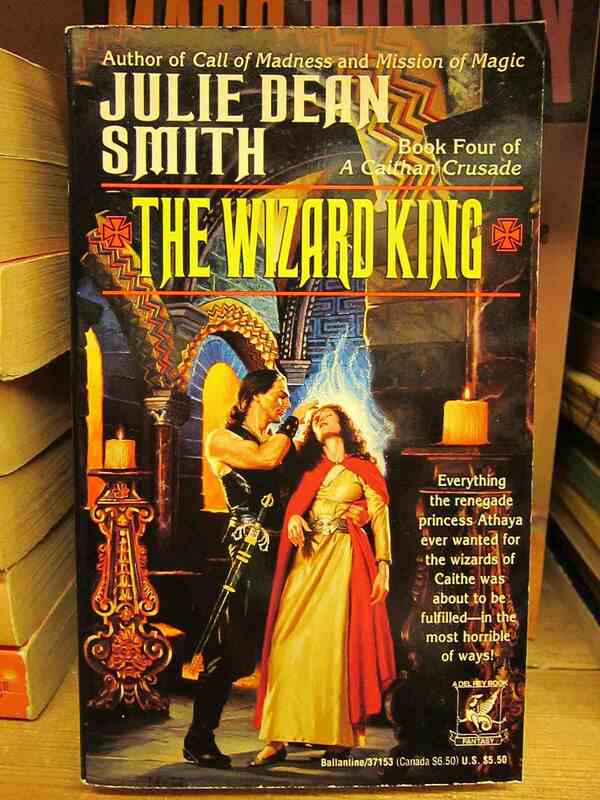 The cover blurb seems to assume that the entire world is familiar with those pesky wizards of Caithe — whoever they may be. The chap from The Golden Horn got around a bit when he was younger. @B’Mancer 17â€”Now that you mention it, I do feel sorta bad about that. Why don’t you spend some time helping him out? You’re still on summer hiatus, aren’t you? Of course I meant left hand. Congenital spatial dyslexia, the curse of left-handers. Wait, wasn’t the Wizard King Γim Morrison? I AM THE LIZARD KING!! Why is he wearing black leather pants and a matching muscle shirt? I didn’t know they had THAT in the Middle Ages! Bill Cosby’s favourite fantasy novel. Too soon, Perry… too soon!